It always surprises me how much I enjoy Kedgeree. Since I’m not usually a fan of eggs in any format, this concoction of rice, fish and boiled eggs doesn’t seem like a natural. 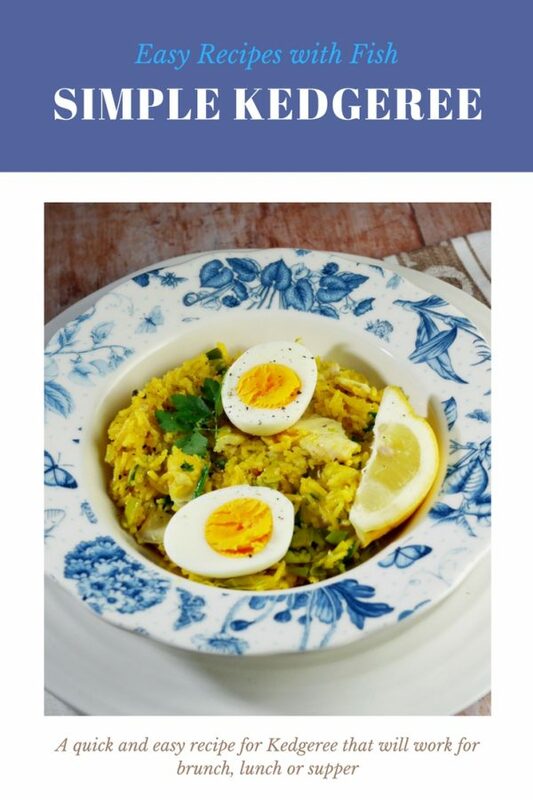 But, somehow Kedgeree without egg just wouldn’t work. Even for me. It’s actually a recipe which lends itself well to experimentation. I’ve enjoyed a hot smoked salmon and quail egg kedgeree before now and I’m intrigued by the suggestion that the original version probably used fresh fish. It’s thought that what we eat today is a derivative of a South Asian dish called Khichri which was a mildly spiced rice and lentil and vegetable dish. It became popular with the colonial British, who added fish and eggs for protein. While parsley is the traditional British herb I’ve used a mixture of parsley and coriander here for extra zest and added delicate saffron rather than turmeric which can be a little bitter. In the past when I made Kedgeree, I’ve boiled the rice on the stove. But, while I was checking recipes over the weekend, I discovered that it’s quite possible to cook the dish in the oven. The result was really very good – the rice seemed fluffier than my stove-top version and I didn’t have to keep remembering to stir the pan. So, in future, I will be cooking my Kedgeree this way. I’ve developed this dish in conjunction with range oven cooker brand, Leisure, who want to work with bloggers to create some Spring themed recipes. And, because of that, I’ve added samphire this time. Originally I’d planned to add asparagus, which is about to come into season right now. But, I was just a little concerned that the delicate flavour would be overwhelmed in the spicy rice mixture. Instead, I found a bunch of samphire, which coincidentally my mum used to call ‘sea asparagus’. 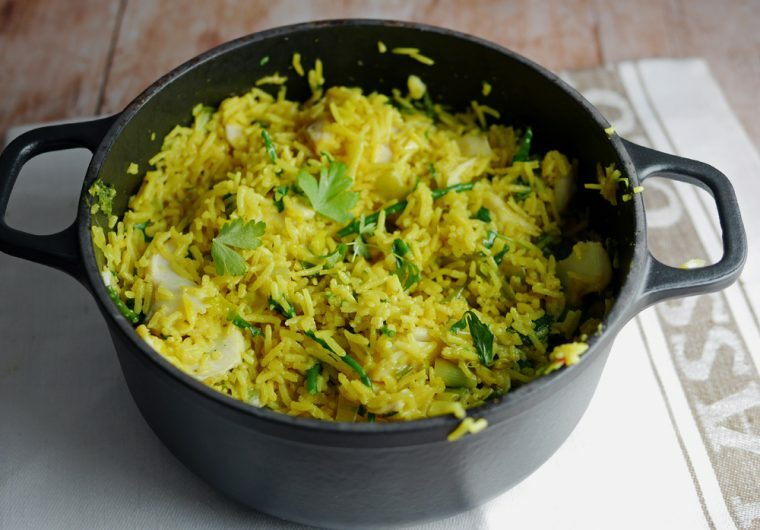 It’s the perfect addition – fine enough that you can just stir it through the hot rice, with just enough sweet, salty crunch to add a little texture to the Kedgeree. Like proper asparagus, it’s a late spring seasonal vegetable so you won’t find English samphire in the shops just yet. It arrives in June and is only available for a few months, until mid-August. This batch came from Israel and turned out to be beautifully tender and succulent, just like early samphire from the British coast. 75 g Samphire Washed and trimmed if necessary. Pre-heat the oven to 200c. Melt the butter with the oil in a heavy oven-proof casserole. Put the eggs in a small pan, cover with cold water. Add a pinch of salt. Bring to the boil, then simmer gently for 10 minutes. Take the rice out of the oven and check that it is cooked. If necessary add more liquid (the milk from poaching the haddock or a little boiling water). Taste and season with pepper and a little salt. Stir through the chopped herbs and samphire. Flake the haddock into the mixture and fold through gently. Taste and add more salt and pepper if required. Cut the eggs in half and use to garnish the dish. Serve with wedges of lemon. Disclosure: I was given a small budget to develop this recipe and write this post. All content is editorially given. 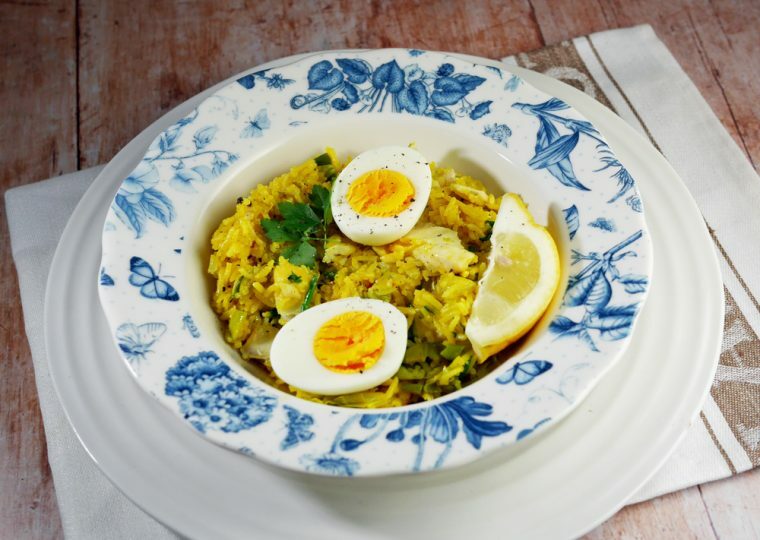 It’s 30 years since I ate Kedgeree and I had forgotten just what a wonderful dish it is.